Svend Bayer runs regular workshops at Kigbeare to teach potters how to get out of their comfort zones and throw bigger pots. 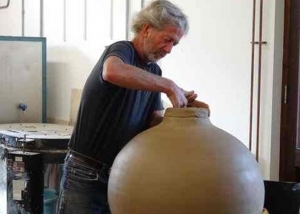 This course is really only suitable for intermediate potters, but provided you can manage a decent cylinder, bowl and plate, Svend will ensure that you leave after three days with better throwing techniques and certainly, throwing larger forms. Each potter will have a Shimpo Whisper wheel, unlimited use of clay, and all the tools necessary. Classes are limited to a maximum of 8 people. All practice pots are usually recycled at the end of the workshop, but if there is one you are particularly proud of, arrangements can be made to buy the clay at cost, and to have it bisque fired at Kigbeare Studios. Cost: £475 to include a vegetarian lunch daily, plus refreshments.